Lost sticker on epoxy type modules, any consistence in the color for identification? I don't remember any color coordination in any I have seen (I don't have the epoxy ones). Is there any number etc. on it? What happens when you plug it in? Yes, the colors are coordinated to module type. The color of the printing on the plastic box, or the color of the epoxy of the potted modules indicates the module type. Red is fuzz, green is frog nose, yellow is filter follower, etc. That being said, any modules that have switches or pots on the module itself (phaser, filter follower, etc.) were not made as an epoxy potted version. Color code seems incomplete or imperfect as tank tone and frog nose are both green. Maybe just a different shade? … is certainly not a compressor. The compressor module was number 12 and the last one of the MPC modules to be produced so it is in the later plastic box. I agree the epoxy ones were color coded to a certain extent. That one may be a treble Bass early module but can't say for certain. Probably a pod or a tank tone ? 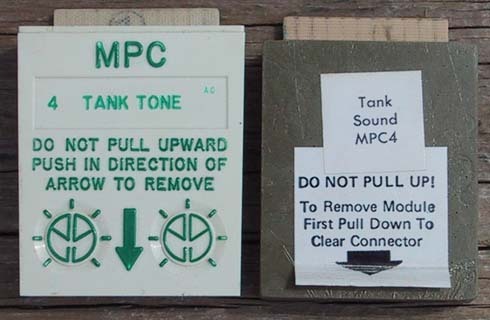 I went back and checked my epoxy MPC modules and if it is a gray color it is the older Power Overdrive.